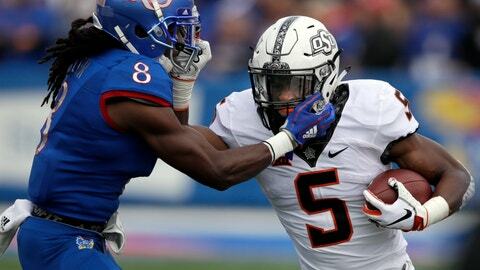 STILLWATER, Okla. (AP) — Oklahoma State coach Mike Gundy limited running back Justice Hill’s workload during the first four games to keep the dynamic playmaker fresh for the heart of the Big 12 schedule. Hill had just 46 carries before Saturday’s 48-28 victory over Kansas, when his workload increased significantly. He responded with a season-high 189 yards and a touchdown on 31 attempts. Hill leads the Big 12 and ranks ninth in the nation with 577 yards on 77 carries. His average of 7.49 yards per carry ranks seventh. A day after his big game, Gundy said Hill appeared to weather the additional physical stress just fine. Against Kansas, Hill had his second-highest totals in both carries and rushing yards. The junior also tied a Big 12 record by scoring a rushing touchdown in his 11th consecutive game. He’ll get a chance to break the mark this week when No. 25 Oklahoma State (4-1, 1-1 Big 12) hosts Iowa State (1-3, 0-2). Gundy said he doesn’t expect Hill to get the ball 31 times again. Gundy said he was comfortable relying on Hill’s backups, J. D. King and Chuba Hubbard, when necessary. Against Kansas, King gained 2 yards on three carries and Hubbard had five attempts, piling up 57 yards and a touchdown. Hill got going immediately, rushing six times for 48 yards on the opening drive. Gundy said the Cowboys’ run blocking has improved, especially since OSU’s 41-17 loss to Texas Tech on Sept. 22.